Agios Efstratios (“Saint Eustratius”), also known as Ai Stratis, is a small island in northeastern Aegean, which lies between Lesvos, Skyros and Limnos. It has a total area of 43.3 square kilometers and its population reaches 376 inhabitants according to 2001 census. 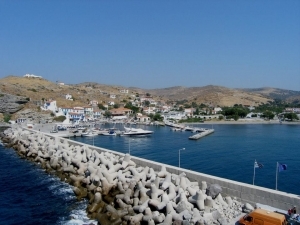 Administratively, along with Limnos, they belong to the district of Lesvos. On the northwest of the island is the only settlement of the island with its picturesque harbor. The main avocations of the inhabitants are fishing, animal livestock, agriculture as well as tourism. During the civil war, Agios Efstratios, had been a place of exile for many important Greek men (like Giannis [“John”] Ritsos, Kostas Varnalis, Mikis Theodorakis, Tassos Livaditis, and Manos Katrakis). The island is named after the miraculous saint Agios Efstratios who lived and died there during the 9th century, whose biography is kept in the temple of Pente Martyron (“Five Martyrs”). The island has many volcanoes and hilly ground that ends in steep cliffs on the east coast. The highest peak is Simadi (“Mark”) with a height of 298 meters and the largest plain is located in Alonitsi. Moreover, it has rich soil as well as little vegetation. Furthermore, it has semi humid climate with moderate rainfalls and infrequent snowfalls. The whole island has been declared a Special Protection Area as part of the Network «NATURA 2000». Agios Efstratios is ideal for quiet vacations close to nature. The small sandy beaches with crystal waters stretch along the coast are perfect for swimming as well as spearfishing. During your stay you will have the opportunity to taste fresh fish, dairy products of fine quality and enjoy the hospitality of the islanders.